Since the 1960s, Washington has tirelessly striven to marginalize, undermine, and destroy the Castro regime, even attempting to assassinate Fidel Castro; first through mercenaries, then psychological operations, and now the pathetic use of spies and soft power. It has been a battle with no quarter given or honor won. One of the techniques that Washington relied on was the use of acts of violence that occasionally enlisted a mixture of physical damage and human jeopardy, then waiting to see what had been brought about. The resulting consequence was that the Cuban population circled the wagons to defend their island from a giant ninety miles away. Washington never rested. In fact, the White House commissioned a non-stop series of illegal warfare to bring down the Castro regime. This process continued to just hours ago when Washington tried to buy off a score of Latin American youth in order to join the anti-Castro core, just as President Raúl Castro was in the midst of a very deep series of economic and political reforms. The Obama administration's policy towards Cuba is characteristic of historical U.S. policy despite the "sea change," which promised a dramatic turn around from the scheming dirty tricks of the past, but has not yet come to pass. Even as John Kerry announced the end of the Monroe doctrine, Washington continued the orthodoxy that had always marked its strategy towards the Cuban nation. Although Obama's representatives intermittently exchanged words about a "progressive dividend," these words were empty calories that bore no energy. Instead, Washington's strategy toward the island has been extreme, one-sided, and has lacked a sorely needed sense of balance from the start. To insist that the United States has anything like the makings of a coherent policy would represent a notable stretch of imagination. Indeed, Obama's Latin America policy is also foreboding in that it reflects neither an overall direction toward enlightenment nor a collection of reliable and sincere components. The only thing in this mosaic of a long history of disappointing policies that remains consistent is the fact that it has brought a good deal of harm to Cuba with the inglorious result of satisfying the still powerful anti-Castro caucus in Congress and a part of the electorate in Florida. Unfortunately, Washington's Cuba policy continues to be heavily propagandized by Florida's cadre of right-wing spear-carriers. This body of ideological warriors has led to the polarization of the U.S. Congress on Cuba policy, and has led to the growing isolation of the United States each time the United Nations casts an almost unanimous vote to lift the antiquated and ever unwise embargo against the island. The poisoning of the troposphere when it comes to the subject of Cuban—U.S. relations never seems to falter. The maintenance of the harsh and ideologically driven rhetoric that has radicalized the domestic opposition to the Castro regime has made any sort of prospect of change regarding Washington's Cuba policy in Congress not only a non-starter, but also an almost certain gesture without prospects. Actually, countries that intersect with the United States, and which must face this type of hyperbolic demonization as a feature of U.S. policy, are few and far between. Washington is an unremitting adversary toward the Cuban revolution and has been so for several generations. This has left little hope that the situation is likely to improve in the near future. No U.S. President, Democratic or Republican, liberal or conservative, has been able to break out of this mold. Obama's early promises about change and cooperation with Cuba quickly evaporated. Over the past few years Cuba has been implementing reforms that should have inspired more dialog with the United States, not less. Washington has basically succumbed to the ever-present musings of the neo-conservative Washington establishment—including such right-wing oddities of the likes of Senator Marco Rubio and other single-factor Florida extremists—and for this reason all potential hope for cooperation with Cuba inexorably fades into a permanent state of far-fetched wishful thinking. It appears that Washington, for the foreseeable future, will continue to follow this pitifully omnipresent default policy of double standards when it comes to Cuba. Washington still has not seen the greatest irony of its actions: in acting to sway Cubans through planting spies in their midst and being shocked when disclosure of these antics leaks to the public, Washington has betrayed its own possibilities for a mutually respectful dialogue with Havana. 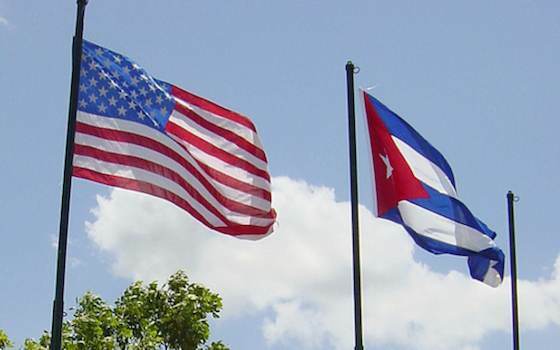 "Gunning After Havana: The Low Point of U.S. - Cuba Policy"